From the Atkins diet, which peaked in late 2003, to Banting, made popular in recent years by Professor Tim Noakes and, lately, the Ketogenic diet (or Keto for short), all indicate that innovation in the low-carb eating arena has become increasingly popular worldwide—with South African companies at the forefront. The company is a long-time leading supplier of value-added, food-safe produce to the retail and foodservice markets in South Africa and prides itself on innovation, housing a product development team that continuously researches new product varieties, packaging and processing methods, as well as cold chain technologies. 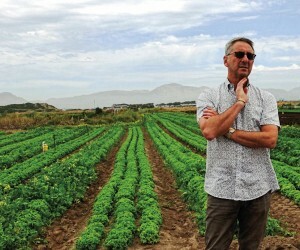 For example, they introduced the bagged lettuce (pillow pack) concept to South Africa roughly 25 years ago after Glazer visited a United Kingdom operation that allowed him four hours’ access to view their operations. “From there, I brought the concept back to South Africa and Dew Crisp adapted it to our local conditions. The bagged salad concept has grown and flourished over the past 25 years,” says Glazer. Glazer concludes that the launch of this new product cements their position as a frontrunner in innovation within the agri-foods industry. “We are proud to be an industry leader in innovation, having successfully introduced and developed many new, exciting and highly innovative ‘firsts’ into the South African market,” he adds. 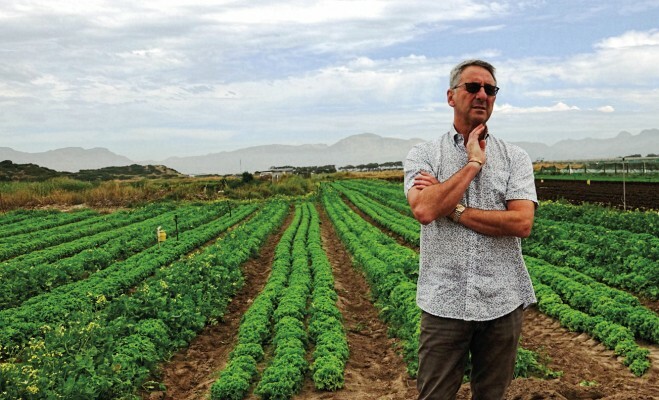 To find out more, Gregory Simpson headed down to their farm in the breadbasket of the Western Cape, Philippi, which continues to produce despite the drought, thanks to rich underground water sources. Please could you tell me about your operations here in Philippi? This is the Cape, where we do most of our farming and production, and we grow, pack and we sell through the wholesale market. We’ve got a wholesale market here on the farm and we sell to the public—so, the hawker trade and a lot of people who then supply to restaurants. Are you servicing the various levels of society from the hawker all the way through to the upper-end supermarket and restaurants? Absolutely, and we grow a wide range of products as well to service all the strata of customers. We will grow everything from kale, Swiss chard, cabbage, onions, carrots to baby spinach, fancy leaf and baby leaf crisp head lettuce, spring onions, etc. Kale seems to be in demand these days? Yes, it’s one of those health foods—super foods—and we grow it. So far, the demand has been okay, it hasn’t been fantastic but yes, there’s definitely a sector of the market that buys kale products from us. Are our eating trends similar to those overseas? Definitely, we follow the European trends, it’s not even a question. In fact, we travel to Europe often to find trends and then bring the seed varieties home. On the farm, we’ve got an ongoing research and development programme for trialling different seeds. So, we are constantly looking at various seed production, seeds, growing variety, seeing how they work in the summer and winter periods because, throughout the year, you’ve got to be able to change varieties, you can’t stick with one variety for 12 months of the year. We are often approached by seed companies first because we like to innovate. So, we will trial them and out of every 20, if you get one, it’s great. What’s your most popular veggie at the moment? Crisp lettuce, onions—we grow a lot of onions, about 2 500 tonnes of onions every year—baby spinach is very popular, fancy leaf. We do it all. How many hectares have you got here? We farm about 140-odd hectares at any one time. Philippi as the breadbasket of Cape Town, is it shrinking or are you able to maintain the size as you get pressure from housing developers? There’s a lot of pressure at the moment to develop part of Philippi, which would be very sad if that happens because it’s such a unique growing area. You cannot replace this, it’s got climate, it’s got soil, it’s got water and there’s no other place in and around the Cape area like it. If this place had to go, Cape Town would have massive problems in terms of food security and all the people who are employed—there’s a huge number of people who are employed in this area. It would be an absolute tragedy. Does the City of Cape Town know how important this area is? I suppose they do and they were trying to preserve it as a heritage site. And it should be preserved as a heritage site but in politics, you never know how things turn out. Skills development is vital in any industry, what are you doing to raise the bar? All the time, it’s ongoing training, you cannot stop with that. Up in Johannesburg, we wrote the standards for all hydroponic production, we lodged with the SETAs and we’ve much in those terms. We continue to do a lot of training. It’s very important; you’ve got to understand the basic principles of agriculture, what it takes for plants to grow and cultural practices that are needed to bring a plant to harvest. Technology must change the way you do your business as well? Technology is changing every single day, non-stop, and to keep abreast of it requires huge capital. But we have to find a balance between total automation and jobs, and you have to walk that fine line. We err more on the side of providing jobs to people than moving to fully automated. When you talk about hydroponics, is that slowly becoming popular? We would look at it if it made economic sense, yes. For us, agri-processing is what we’re about, thus, we would look at any product that made sense from an agri-processing point of view. We like to look at the entire value chain, which is what we invested in. We invested in the farm, all the way to the delivery to the final customer—we call it from farm to fork. Naturally, we don’t own the retail chain space but we invested in right up to the where we deliver to our customer. You’ve taken out the middleman? The only middleman we interact with is the customer who comes and buys from our wholesale market and we love that, we encourage that. We can’t do it all, therefore, we’ve reached out to many of the companies that distribute to restaurants, catering etc., to come and buy directly from us. How do you keep up with demand? Due to the fact that there’s a six-month lag, we’ve got to be able to understand what the market is going to need in six months. We’ve got to grow it because in manufacturing, in our processing plants, you don’t have stock you can simply draw off the shelf. We’ve got to grow our stock and to be able to do that, we’ve got to understand the market demands. Because we’ve been in this business for 34 years, we’ve gained good experience, we have a good feel for the market trends and we always monitor our growing programmes from week to week. Therefore, we’re able to start adjusting from week to week if we see that the market is pulling more of the one product and less of the other. Even though it takes a bit of time, we’re adjusting all the time. What’s the ‘highest maintenance’ crop to grow? Leaf is extremely difficult to grow because it’s very sensitive to stress, whether its weather, water—the leaf category is very, very difficult, it’s a sensitive crop. The farms here are quite open, is theft a problem? Yes, it is a problem, very much so, but we try to manage that as best as possible. The ground still seems very moist here, to what degree has the drought affected you? Well, fortunately, we had a bit of rain, but we’re situated on the Cape Aquifer, so it’s low, even though the quality of the water is not the best—you can’t just drink that water. It’s very high in saline but the methodology of farming and the adaption of being able to use the saline water is really what is quite unique. Organic is a big buzzword—are you doing that? Many of these companies say they’re organic but how do you actually prove that something is organic? Yes, organic. We talk about responsible farming; responsible farming in that we are audited for EuroGAP, farming for the future and so forth—there’s a very strict ruling around what and how to farm. I would say that our product is as close to organic as you can get but to be organically certified, it’s like a Michelin star rating. Your relationship with the government, are they supportive? We’re not like many of the European countries, there are no subsidies in South African farming at all, which is pure market supply and demand. The government has come to the party from time to time when some of the areas have been really affected, drought-wise, I’m sure the government could do a lot more. Farming is, without a doubt, the backbone of any economy; it’s such an important part of the economy, thus, the more that the government can do for the farming and the farming sector, the better. What’s happening at the moment with all these farm murders—it’s just too terrible for words. Is the ‘land expropriation without compensation’ talk also making matters difficult? Yes, that is also very unsettling and it’s difficult to make long-term plans.